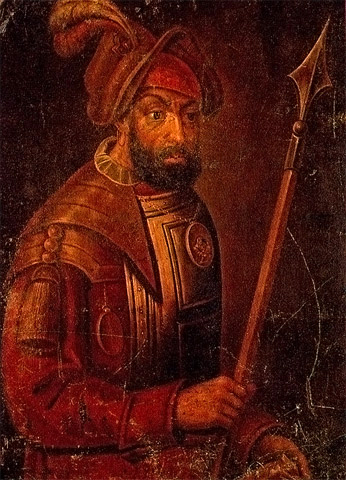 English: Ancient portray of Yermak, the first leader of the exploration of Siberia. The type of painting is called "parsúna" (from "persona" - person), it was transitional style between abstract iconographics and real paintings. Neither this, nor any other Yermak's portray (parsuna) was made in his lifetime. All the portrays were made by the descriptions from the chronicles. Another portray, and one more (click on image to enlarge). Esperanto: Jermak Timofejeviĉ, la konkeranto de Sibirj.